Zebra mussel and the closely related and ecologically similar quagga mussels are filter-feeding organisms. They remove particles from the water column. The zebra mussels process up to one liter of water per day, per mussel. Some particles are consumed as food, and feces are deposited on the lake floor. Nonfood particles are combined with mucus and other matter and deposited on lake floors as pseudofeces. Since the zebra mussel has become established in Lake Erie, water clarity has increased from 6 inches to up to three feet in some areas. This improved water clarity allows sunlight to penetrate deeper, enabling growth of submerged macrophytes. These plants, when decaying, wash up on shorelines, fouling beaches and cause water quality problems. Lake floor food supplies are enriched by zebra mussels as they filter pollution out of the water. This biomass becomes available to bottom-feeding species and to the fish that feed on them. The catch of yellow perch increased 5 fold after the invasion of zebra mussels into Lake St. Clair. Zebra mussels attach to most substrates including sand, silt, and harder substrates, but usually, juvenile mussels prefer harder, rockier substrates to which to attach. Other mussel species frequently represent the most stable objects in silty substrates, and zebra mussels attach to, and often kill these mussels. 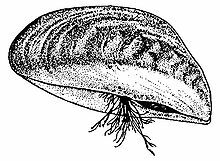 They build colonies on native unionid clams, reducing their ability to move, feed, and breed, eventually leading to their deaths. This has led to the near extinction of the unionid clams in Lake St. Clair and the western basin of Lake Erie. This pattern is being repeated in Ireland, where zebra mussels have eliminated the two freshwater mussels from several waterways, including some lakes along the River Shannon in 1997. In 2012, the National University of Ireland, Galway, said "The discovery of zebra mussels (Dreissena polymorpha) in Lough Derg and the lower Shannon region in 1997 (McCarthy et al 1997, a & b) has led to considerable concern about the potential ecological and economic damage that this highly invasive aquatic nuisance species can cause." The lifespan of a zebra mussel is four to five years. 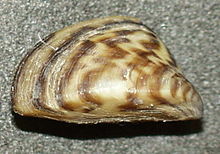 A female zebra mussel begins to reproduce within 6–7 weeks of settling. An adult female zebra mussel can produce 30,000 to 40,000 eggs in each reproductive cycle, and over 1 million each year. Free-swimming microscopic larvae, called veligers, drift in the water for several weeks and then settle onto any hard surface they can find. Zebra mussels also can tolerate a wide range of environmental conditions and adults can even survive out of water for about 7 days. Crayfish could have a significant impact on the densities of 1- to 5-mm-long zebra mussels. An adult crayfish consumes around 105 zebra mussels every day, or about 6000 mussels in a season. Predation rates are significantly reduced at lower water temperatures. Fish do not seem to limit the densities of zebra mussels in European lakes. Smallmouth bass are a predator in the zebra mussels' adopted North American Great Lakes habitat. On June 4, 2014, Canadian conservation authorities announced that a test using liquid fertilizer to kill invasive zebra mussels was successful. This test was conducted in a lakefront harbor in the western province of Manitoba. However, there continue to be outbreaks in Lake Winnipeg. Similar tests were run in Illinois, Minnesota, and Michigan, using Zequanox, a biopesticide. Researchers have found that Niclosamide proves effective in killing invasive zebra mussels in cool waters. The native distribution of the species is in the Black Sea and Caspian Sea in Eurasia. Zebra mussels have become an invasive species in North America, Great Britain, Ireland, Italy, Spain, and Sweden. They disrupt the ecosystems by monotypic colonization, and damage harbors and waterways, ships and boats, and water treatment and power plants. Water treatment plants are most affected because the water intakes bring the microscopic free-swimming larvae directly into the facilities. Zebra mussels also cling to pipes under the water and clog them. Grossinger reported it in Hungary in 1794. Kerney and Morton described the rapid colonization of Britain by the zebra mussel, first in Cambridgeshire in the 1820s, London in 1824, and in the Union Canal near Edinburgh in 1834. In 1827, zebra mussels were seen in the Netherlands at Rotterdam. Canals that artificially link many European waterways facilitated their early dispersal. It is nonindigenous in the Czech Republic in the Elbe River in Bohemia since 1893; in southern Moravia, it is probably native. Around 1920 the mussels reached Lake Mälaren in Sweden. The first appearance of the organism in northern Italy was in Lake Garda in 1973; in central Italy, they appeared in Tuscany in 2003. Zebra mussels are also present in British waterways. Many water companies are reporting having problems with their water treatment plants with the mussels attaching themselves to pipeworks. Anglian Water has estimated that it costs £500,000 per year to remove the mussels from their treatment plants. It has been argued that zebra mussels have also had an effect on fishing, for example at Salford Quays, where the introduction of zebra mussels has changed the environment for the fish. They were first detected in Canada in the Great Lakes in 1988, in Lake St. Clair, located east/northeast of Detroit and Windsor. It is believed they were inadvertently introduced into the lakes in the ballast water of ocean-going ships traversing the St. Lawrence Seaway. Another possible, often neglected, mode of introduction is on anchors and chains, although this has not been proven. Since adult zebra mussels can survive out of water for several days or weeks if the temperature is low and humidity is high, chain lockers provide temporary refuge for clusters of adult mussels that could easily be released when transoceanic ships drop anchor in freshwater ports. They have become an invasive species in North America, and as such they are the target of federal policy to control them, for instance in the National Invasive Species Act (1996). Using models based on the genetic algorithm for rule-set production (GARP), a group of researchers predicted that the southeastern United States is moderately to highly likely to be inhabited by zebra mussels and the Midwest unlikely to experience a zebra mussel invasion of water bodies. However, this model has since been proven incorrect. In 2006 a researcher (also using GARP) predicted invasion as far west as the North Platte River, Nebraska, by 2015. As of March 2016, zebra mussels have affected hundreds of lakes in the Midwest including Lake Michigan, and the largest freshwater lake in Wisconsin, Lake Winnebago. See the March 2016 USGS Zebra mussel distribution map for full scope of invasion. Congressional researchers have estimated that the zebra mussel has cost businesses and communities over $5 billion since their initial invasion. Zebra mussels have cost power companies alone over $3 billion. In July 2010, the North Dakota Game and Fish Department confirmed the presence of zebra mussel veliger in the Red River between Wahpeton, ND, and Breckenridge, MN. As recently as 2008 California similarly reported invasions. In 2011, an invasion of zebra mussels shut down a water pipeline in the Dallas area. This resulted in reduced water supplies during a drought year, worsening water restrictions across the Dallas area. A common inference made by scientists predicts that the zebra mussel will continue spreading passively, by ship and by pleasure craft, to more rivers in North America. Trailered boat traffic is the most likely vector for invasion into Western North America. This spread is preventable if boaters thoroughly clean and dry their boats and associated equipment before transporting them to new bodies of water. Since no North American predator or combination of predators has been shown to significantly reduce zebra mussel numbers, such spread would most likely result in permanent establishment of zebra mussels in many North American waterways. A major decrease in the concentration of dissolved oxygen was observed in the Seneca River in central New York in the summer of 1993. This decrease was due to extremely high concentrations of zebra mussels in the watershed. Additionally, the Seneca River had significantly less chlorophyll in the water, which is used as a measure of phytoplankton biomass, due to the presence of zebra mussels. The cost of fighting the pests at power plants and other water-consuming facilities is substantial, but the exact magnitude of the damage is a matter of some controversy. According to the Center for Invasive Species Research at the University of California, Riverside, the cost of management of zebra mussel in the Great Lakes alone exceeds $500 million a year. A more conservative study estimated total economic costs of $267 million for electric-generation and water-treatment facilities in the entire United States from 1989 through 2004. Zebra mussels are filter feeders. When in the water, they open their shells to admit detritus. As their shells are very sharp, they are known for cutting people's feet, resulting in the need to wear water shoes wherever they are prevalent. Since their colonization of the Great Lakes, they have covered the undersides of docks, boats, and anchors. They have also spread into streams and rivers throughout the US. In some areas they completely cover the substrate, sometimes covering other freshwater mussels. They can grow so densely that they block pipelines, clogging water intakes of municipal water supplies and hydroelectric companies. Zebra mussels do not attach to cupronickel alloys, which can be used to coat intake and discharge grates, navigational buoys, boats, and motors where the species tends to congregate. Zebra mussels are believed to be the source of deadly avian botulism poisoning that has killed tens of thousands of birds in the Great Lakes since the late 1990s. They are edible. However, because they are so efficient at filtering water, they tend to accumulate pollutants and toxins. For this reason, most experts recommend against consuming zebra mussels. They are also responsible for the near extinction of many species in the Great Lake system by outcompeting native species for food and by growing on top of and suffocating the native clams and mussels. Zebra mussels also affect all classes of algae species, resulting in a shortage of food sources to native species of freshwater mussels and fish in the Great Lakes. However, zebra mussels and other non-native species are credited with the increased population and size of smallmouth bass in Lake Erie and yellow perch in Lake St. Clair. They cleanse the waters of inland lakes, resulting in increased sunlight penetration and growth of native algae at greater depths. This cleansing also increases water visibility and filters out pollutants. Each quagga and zebra mussel filters about 1 US quart (0.95 L) of water a day when confined to small tanks. In lakes, their filtering effects are usually spatially restricted (near the lake bottom) due to nonhomogeneous water column mixing. Because zebra mussels damage water intakes and other infrastructure, methods such as adding oxidants, flocculants, heat, dewatering, mechanical removal, and pipe coatings are becoming increasingly common. ^ "Dreissena polymorpha (Pallas, 1771)". World Register of Marine Species. 2013. Retrieved Feb 25, 2017. ^ Hoddle, M. S. "Quagga & Zebra Mussels". Center for Invasive Species Research, UC Riverside. Retrieved 2010-06-29. ^ Mollusca Slovenska [The Slovak molluscs]. VEDA vydavateľstvo Slovenskej akadémie vied, Bratislava, 344 pp. ^ The National Atlas of the United States of America (2009-09-17). "Zebra Mussels". Nationalatlas.gov. Archived from the original on 2010-05-27. Retrieved 2010-06-29. ^ "Zebra mussel — Invasive species: Minnesota DNR". Dnr.state.mn.us. 1999-08-24. Retrieved 2010-06-29. ^ a b Amy Benson (2009-12-22). "Zebra mussel FAQs". Fl.biology.usgs.gov. Retrieved 2010-06-29. ^ a b Schloesser, Don W.; Nalepa, Thomas F. (1994). "Dramatic decline of unionid bivalves in offshore waters of western Lake Erie after infestation by the zebra mussel, Dreissena polymorpha". USGS Great Lakes Science Center. Retrieved 2014-10-20. ^ Garton, D. W.; Berg, D. J.; Stoeckmann, A. M.; Hagg, W. R. (1993). "Biology of recent invertebrate invading species in the Great Lakes: The spiny water flea, Bythotrephes cederstoemi, and the zebra mussel, Dreissena polymorpha" (in B. N. McKnight editor. Biological pollution: The control and impact of invasive exotic species. ed.). Indianapolis, Indiana. : Indiana Academy of Science. : 63–84. ^ Sagoff, M. "What's Wrong with Exotic Species?" (PDF). College Park, Maryland: Institute for Philosophy and Public Policy, Maryland School of Public Affairs. Retrieved 24 February 2017. ^ "New Zebra Mussel Webpage". Retrieved 2012-10-14. ^ Borcherding, J. (1991). "The annual reproductive cycle of the freshwater mussel Dreissena polymorpha Pallas in lakes". Oecologia. 87 (2): 208–218. doi:10.1007/bf00325258. ^ "Zebra Mussels (Dreissena polymorpha)". Archived from the original on 2014-05-08. Retrieved 2014-05-25. ^ Daniel P. Molloya; Alexander Y. Karatayevb; Lyubov E. Burlakovab; Dina P. Kurandinac; Franck Laruellea (1997). "Natural enemies of zebra mussels: Predators, parasites, and ecological competitors". Reviews in Fisheries Science. 5 (1): 27–97. doi:10.1080/10641269709388593. ^ a b Mackie, G; Gibbons, W; Muncaster, B; Gray, I (1989). "The Zebra Mussel, Dreissena polymorpha: A synthesis of European Experiences and a preview for North America". Ontario Ministry of Environment. ^ "Manitoba stops zebra mussel invasion with fertilizer". Retrieved 2014-06-04. ^ "Potash experiment killed zebra mussels at infested harbour, officials say". Retrieved 2014-06-04. ^ a b "Manitoba family spots 'dark clumps' of zebra mussels at Grand Beach". Retrieved 2017-06-06. ^ "Michigan-made pesticide Zequanox adds muscle to war on zebra mussels". Retrieved 2017-01-29. ^ "Researchers find new methods to combat invasive zebra mussels". The Minnesota Daily. Retrieved 2018-11-26. ^ Blažka, F. (1893). "Do Čech zavlečená slávka: Dreissena polymorpha Pall". Vesmír (in Czech). 22 (15): 177–178. ^ (in Czech) Horsák M., Juřičková L., Beran L., Čejka T. & Dvořák L. (2010). "Komentovaný seznam měkkýšů zjištěných ve volné přírodě České a Slovenské republiky. [Annotated list of mollusc species recorded outdoors in the Czech and Slovak Republics]". Malacologica Bohemoslovaca, Suppl. 1: 1–37. PDF. ^ Giusti F; Oppi E (1973). "Dreissena polymorpha (Pallas) nuovamente in Italia. (Bivalvia, Dreissenidae)". Mem Mus Civ St Nat Verona (in Italian). 20: 45–49. ^ Elisabetta Lori; Simone Cianfanelli (2006). "New records of Dreissena polymorpha (Pallas, 1771) (Mollusca: Bivalvia: Dreissenidae) from Central Italy" (PDF). Aquatic Invasions. 1 (4): 281–283. doi:10.3391/ai.2006.1.4.11. 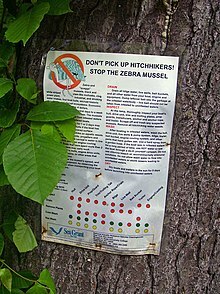 ^ "British waterways fight invasion by Russian zebra mussels". BBC News. 2011-08-04. ^ "Angling club closes down at 'clean' Salford Quays". BBC News. 19 December 2011. Retrieved 2011-12-19. 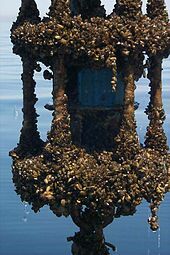 ^ a b c "Zebra Mussels Overwhelm U.S. Waterways in the Great Lakes Region and Beyond – Copper Screens and Coatings Provide a Solution to this $500 million Problem". Copper Development Association. 2009-07-30. Archived from the original on 2011-03-13. Retrieved 2011-03-13. ^ Drake, John M., and Jonathan M. Bossenbroek (2004). "The Potential Distribution of zebra mussels in the United States." BioScience (Vol. 54, No 10). Retrieved 2014-2-19. 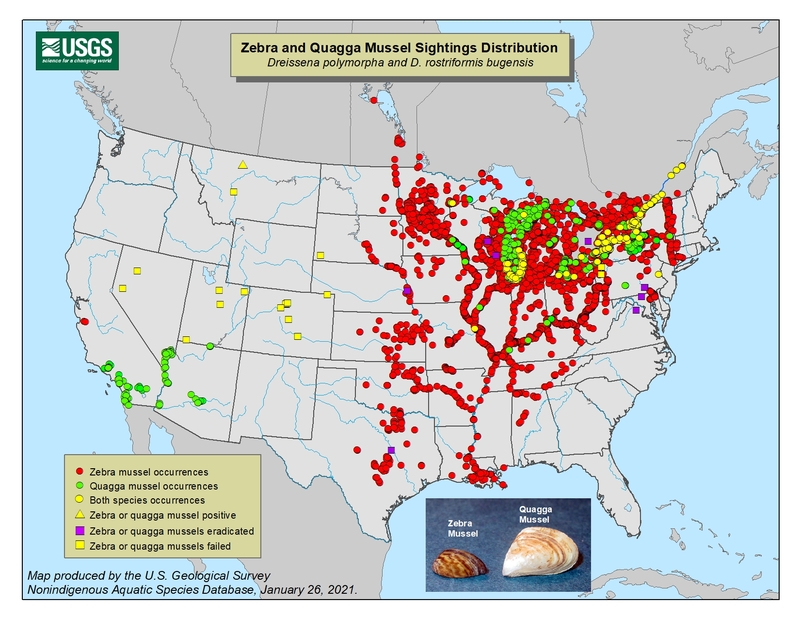 ^ "Zebra Quagga Mussel Sightings Distribution". USGS. USGS. Retrieved 2016-04-10. ^ a b "Zebra Mussels". Virginia Department of Game and Inland Fisheries. Archived from the original on 8 May 2014. Retrieved 10 March 2015. ^ "2 Mass. towns start fight against zebra mussel". Boston Herald. 2009-07-13. ^ "Zebra mussels found in Pelican Lake in Otter Tail County" (Press release). MN Department of Natural Resources. 2009-09-17. Retrieved 2009-09-18. ^ "Zebra Mussel Discovered in North Dakota" (Press release). ND Game and Fish Department. 2010-07-01. Retrieved 2010-07-02. ^ "Quagga and Zebra Mussels Incident Description". CA Department of Fish & Wildlife. Retrieved 2018-06-05. ^ Stoler, Steve (2011-10-26). "Water district braces for North Texas drought crisis | wfaa.com Dallas – Fort Worth". Wfaa.com. Retrieved 2012-01-05. ^ Effler, Steven W., Carol M. Brooks, Keith Whitehead, Bruce Wagner, Susan M. Doerr, MaryGail Perkins, Clifford A. Siegfried, Leigh Walrath and Raymond P. Canale (1996). "Impact of Zebra Mussel Invasion on River Water Quality." Water Environment Research (Vol. 68, No 2). pp. 205–214. Retrieved 2014-2-19. ^ Connelly, NA; O'Neill, CR Jr; Knuth, BA; Brown, TL (2007-05-24). "Economic impacts of zebra mussels on drinking water treatment and electric power generation facilities". Environ Manage. 40 (1): 105–12. doi:10.1007/s00267-006-0296-5. PMID 17530329. ^ Janega, James (2008-01-15). "Botulism takes fatal toll on thousands of Great Lakes birds". Chicago Tribune. Archived from the original on 2011-04-05. Retrieved 2011-04-05. ^ "Zebra Mussels – Too Toxic for 'Taste Of"". Buffalo Rising Online. Sep 24, 2008. Retrieved Jan 5, 2012. ^ "Minnesota Sea Grant Overview". Retrieved 2011-12-02. ^ Nicholls, Kenneth H.; Hopkins, Gordon J. (1993-01-01). "Recent Changes in Lake Erie (North Shore) Phytoplankton: Cumulative Impacts of Phosphorus Loading Reductions and the Zebra Mussel Introduction". Journal of Great Lakes Research. 19 (4): 637–647. doi:10.1016/S0380-1330(93)71251-4. ^ "Report at ESPN Sports". Sports.espn.go.com. 2005-03-16. Retrieved 2010-06-29. ^ "Great Lakes: 'Amazing change'". Retrieved 2009-08-06. ^ Strayer, David L. (2009). "Twenty Years of Zebra Mussels: Lessons from the Mollusk That Made Headlines." Frontiers in Ecology and the Environment (Vol. 7, No 3). pp. 135–141. Retrieved 2014-2-19. Minchin, D (2003). "The Zebra Mussel Dreissena polymopha (Pallas) extends its range westwards in Ireland". Bulletin of the Irish Biogeographical Society. 27: 176–182. ISSN 0332-1185. Wikimedia Commons has media related to Dreissena polymorpha. Species Profile- Zebra Mussel (Dreissena polymorpha), National Invasive Species Information Center, United States National Agricultural Library. Lists general information and resources for Zebra Mussel.